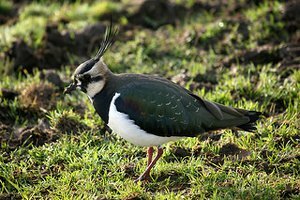 A charismatic bird, the Lapwing is very defensive when nesting, creating a fuss about almost anything which enters it's territory, swooping and calling to cause a distraction. Other waders often nest near Lapwings for the protection they afford. 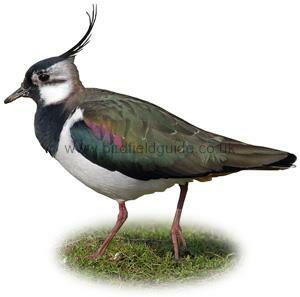 The Lapwing has several names including Green Plover, Peewit and Northern Lapwing. Lapwing feeding, note mottled neck indicating winter plumage although the crest is quite long. The Lapwing from a distance looks black and white but it's upperparts are actually dark green. The crest is smaller in the female and in winter. 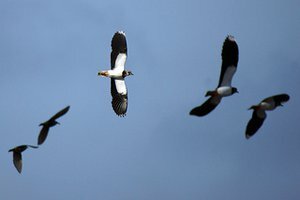 In flight the Lapwing has a slow wing beat but is a fast and acrobatic flyer. The Lapwing is a large plover with dark green upperparts and white underparts. It has a black breast band and a distinctive crest. Breeds on wet pasture and upland fields. In winter it can be found around estuaries and coastal farmland. 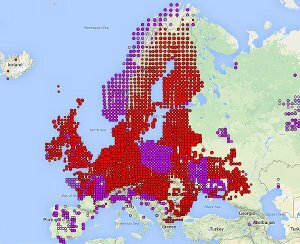 Found throughout most of Europe, in winter it moves South and West. Was once a common breeding farmland bird in the UK, however numbers have fallen dramatically and most of the breeding birds are now located in Scotland. In winter it is more widespread in the UK and can be found almost everywhere.